GestIC is here! 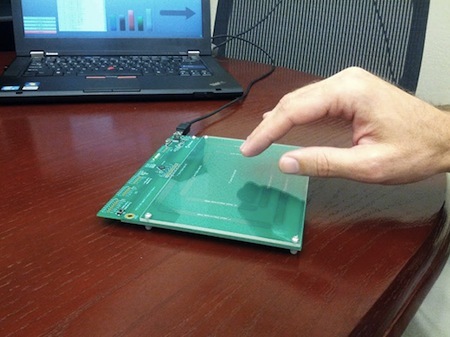 Microchip Technology is releasing the first gesture interface controller that uses electrical fields to make 3-D measurements. Microchip's MGC3130 is the world’s first electrical near field (E-field) 3D Tracking and Gesture Controller. Based on Microchip’s patented GestIC® technology, it allows users to interact with their devices using hand/finger position tracking and intuitive free-space gestures in real time. The MGC3130 is a unique solution that enables the next breakthrough in user interface design. GestIC® technology uses transmit (Tx) frequencies f in the range of 100 kHz, which reflects a wavelength of about three (3) kilometers. With electrode geometries of typically less than twenty (20) by twenty (20) centimeters, this λTx wavelength is much larger in comparison. 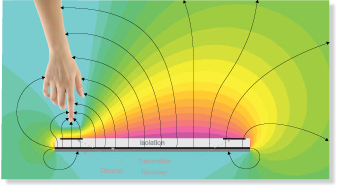 Therefore, the magnetic component is practically zero and no wave propagation takes place. The result is a quasi-static electrical near field that can be used for sensing conductive objects such as the human body. 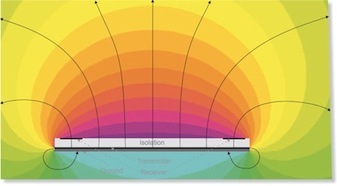 Once a user intrudes the sensing area, the electrical field distribution becomes distorted. The field lines intercepted by the hand are shunted to ground through the conductivity of the human body itself. The simulation results in Figure 1 and Figure 2 show the influence of an earth grounded body to the electric field. As illustrated, the proximity of the body causes a compression of the equipotential lines and shifts the receiver (Rx) electrode signal levels to a lower potential which is detected by the respective GestIC® technology product. Zaphod Beeblebrox would love this. In his 1979 novel The Hitchhiker's Guide to the Galaxy, Douglas Adams describes a similar gesture-controlled interface that, well, could be a bit more precise. Let's hope that Microchip Technology's GestIC offers greater precision! Via Technology Review and of course Microchip GestIC.